The hardest part of preparing for surgery is not knowing what it will be like. If you’re about to undergo brachioplasty, you may be feeling particularly anxious about the aftermath of your procedure. The following information will help you feel more at ease so that you know what to expect after arm lift surgery. After your surgery, you will be discharged home that same day. Take this opportunity to rest, as your body will be tired from surgery. You should anticipate the possibility of discomfort, bruising, swelling, and redness in your arms, all of which are temporary. By three or four days after your surgery, you may be ready to return to work. Even though you may return to work, your activities should still be limited, with minimal use of your arms for the first one to two weeks as well as limited exercise for up to six weeks. Your surgeon will provide you with detailed instructions to follow during your recovery so that you can have the best recovery experience and minimize your risk of infection or complications. During recovery, you should follow all postoperative instructions. Take your medications as prescribed to reduce the risk of infection. The first week of recovery, you will have only limited use of your arms. Be careful not to use excess motion, abrasion, or force on your incisions. Wear comfortable, loose tops that open in the front for the first two weeks so that you will not have to lift your arms above your head. You should wear a compression garment for three to six weeks after recovery to help your arms heal and produce more ideal results. Finally, by six weeks after your procedure, you should be able to resume normal activities with your doctor’s approval. Discomfort is common early after brachioplasty. You will likely have bruising, swelling, redness, and mild to moderate discomfort during the first week or two of recovery. Oral pain medications can reduce any pain during this time. Following all postoperative activity instructions, including when and how to wear your compression garment and how to treat your incisions, will help minimize your discomfort. Scarring is common after any surgery. You will likely have permanent scarring where the incisions are placed. These incisions are discreetly placed on the inside of the arms so that they will not be noticeable during most activities. Some patients need longer incisions than others, and these patients are likely to have increased scarring. Your surgeon will take great care when suturing the incisions to achieve the best scar possible. Most patients feel that any degree of scarring is preferable to sagging upper arm skin. By treating your incisions carefully and taking advantage of tools such as embrace® Active Scar Defense, you may be able to minimize your scars. Limit sun exposure to the area so that the scar tissue will not darken unfavorably. As with all scars, any visible scarring will likely fade over time. While you will see some initial results shortly after your surgery, they will be temporarily obstructed by swelling. Usually by around six weeks after surgery, most of your major swelling will have subsided and you will be able to see your results. The removal of tissue through brachioplasty is permanent, meaning you can enjoy your new upper arm contours for many years as long as you maintain a stable body weight and live a healthy lifestyle. Exercise will keep your muscle tone strong so that your arms remain well-defined, and it will also help prevent future weight gain. With your newly improved upper arm contours, you may feel more self-confident and have a more positive self-image. You will likely feel as though you can finally wear certain clothing items (e.g., swimsuits, sleeveless tops, and fitted sleeves) that you previously avoided. 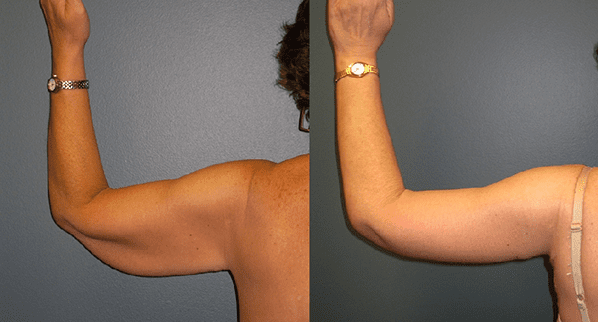 Arm lift surgery improves the contour of the upper arms and can boost your image in the eyes of others and yourself. Dr. Matthew Conrad is a board-certified plastic surgeon who can perform arm lift surgery to improve the definition, tone, and contours of your upper arm. To learn more about this procedure, schedule your personal consultation with Dr. Conrad. Please call (316) 681-2227 or complete our online contact form to request your appointment today.